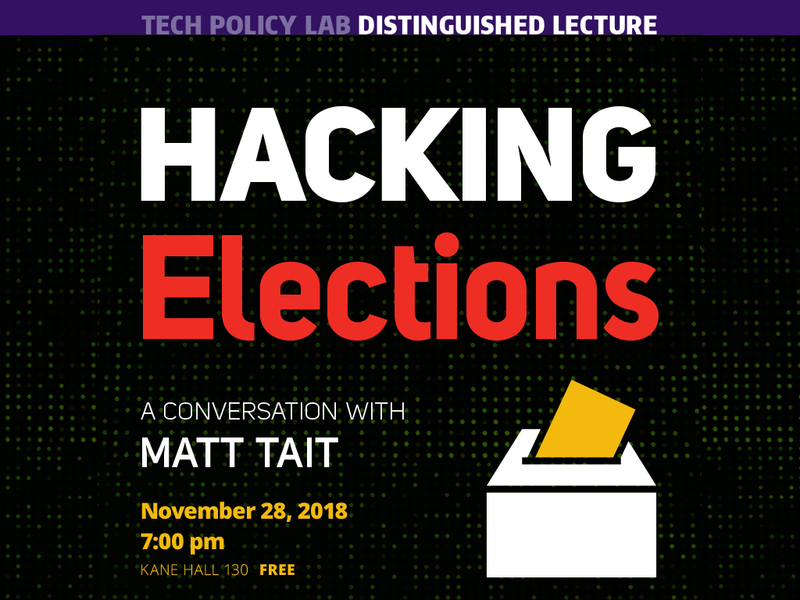 Wednesday, Nov 28, 2018, 7 – 8:30 p.m.
Join the Tech Policy Lab for an interview with cybersecurity expert and former British intelligence officer Matt Tait on foreign interference with the midterm elections. Tait helped detect Russian interference in the 2016 election and will discuss a range of topics, including meddling in the midterms, the status of the Russia investigation, and what can be done about foreign interference in a digital age. Matt Tait is a senior fellow at the Robert S. Strauss Center for International Security and Law at the University of Texas at Austin where he teaches cyber-security to law and public policy students. Previously Tait worked in private industry as a consultant to US tech companies such as Microsoft and Amazon, and worked in Google’s Project Zero security team. Prior to that, Tait worked on cybersecurity issues at the UK’s GCHQ intelligence agency. Tait can be found on Twitter at @pwnallthethings.